Time to dust off this old blog and build a new PULP GIRLS hub out of it. Please bear with us while we do that. Things have been pretty quiet on the Pulp Girls front for a while, but I'm still developing it moving forward, with love and insanity, so please stay patient, and stay tuned to this space. But you CAN follow the blog, over on the side there, and I will create the social network things too. In the meantime, to get your fix of girl pulp action, pick up the 2010 preview books if you haven't (the 2009 preview books have now completely sold out), or check out the Swiss Army Woman origin playing in the Pulp Girl Grindhouse. Could this be a new PULP GIRLS book? We'll be kicking off the convention season this weekend at Emerald City Comicon in Seattle WA. 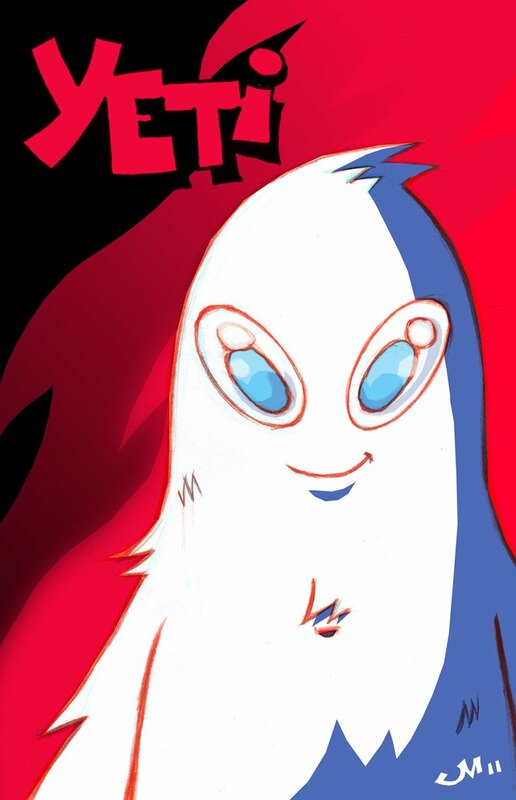 At the show we'll have a new book, YETi (which is actually an updated and remixed version of a short that originally appeared in Josh Howard's Sasquatch a couple years ago), which may or may not be a PULP GIRLS book?!? Stop by to find out!! Welcome to the Pulp Girls grindhouse!!! In the future man will colonize Mars, and we'll also be showing all our Pulp Girls in the grindhouse theater, for virtual low-lives such as yourself (and Martian terraformers), completely free of charge! Then, once a new feature goes up, and the theater grinds on, you'll be able to access old content, for pennies on the dollar! Just click on the cover and your feature will begin! Once these are gone, they are all gone. UPDATE: Cards have completely sold out, thank you. Just an update for those that pre-ordered Pulp Girls packs via us directly, due to timing issues, the packs will ship out following SDCC, on 7/27. UPDATE 8/2 - All presales have shipped, with some extras for the wait! art/graphics/comics Publisher - Action Lab: Danger Zone Jason Martin (aka JMart) Jason has been working in comics since 2005 with his self-published critically acclaimed series, Super Real. While creating Super Real Jason also started publishing other works via his SR Graphics imprint, and joined Action Lab to run their new mature readers line, Danger Zone in 2012. Jason also does freelance art as JMart, with clients including; Uppder Deck (Marvel), Cartoon Network (Adult Swim), and more. In addition to his freelance work, and role as publisher of Danger Zone, he’s also currently the creator, writer and colorist of the comic series Night of the 80′s Undead.